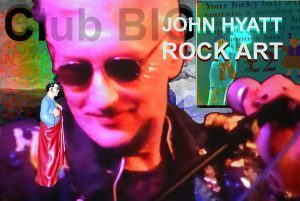 These are the words of John Hyatt, artist, musician, author, teacher, punk and scientist. A self-confessed optimist, he has imbued his new exhibition at HOME with a tantalising combination of individualist art practice and collaborative endeavour. Put simply, his intention is to demonstrate a new way of working. After more than 18 months in development, Hyatt’s show – Rock Art – has finally come to fruition. So, what can people expect to see as they weave their way round the exhibition? In this vein, visitors to HOME will initially be presented with a series of solo works by Hyatt, including The First Great Deception and The Collection and Reading Room, the latter featuring a limited edition of Hyatt as a blend of tea. There is also the Rock Shop, a riot of merchandise based on his life and work. However, Hyatt says that this part of the exhibition should not be viewed as a trip down memory lane. After passing through these areas of personal objects and narratives, the focus shifts to Club Big, a pop-up music club, debating chamber and live art space. 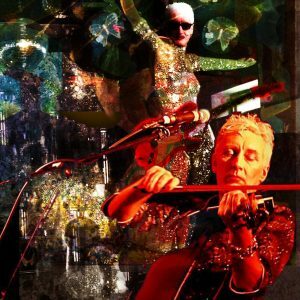 Throughout the course of exhibition, Friday evenings will be dedicated to this diverse display of talent, featuring, among others, Jon Langford with Barkley McKay, Rosie Garland, Tom Hyatt with Maya McCourt and a performance by Hyatt’s band, The Three Johns. But the people on stage aren’t the only element of collaboration in this unique space. Rock Art is Hyatt’s first show at HOME but he has a long history with Manchester’s Cornerhouse. In fact, this Wolverhampton-born artist, who has spent all of his adult life in Yorkshire and then the North West, was part of Cornerhouse’s first show back in 1986. Rather appropriately, it was called Connections, a theme which wends its way through his 2017 exhibition. This idea of transmutation is key to Hyatt’s thinking, particularly when it comes to the name of the show. Looking to the future is clearly part of Hyatt’s DNA, not least because a life-changing event made him reevaluate his own path. After a quarter of a century in Manchester, first as Head of Department of Fine Arts at MMU and later as director of MIRIAD (Manchester Institute for Research and Innovation in Art and Design), throat cancer forced him to take a year off and reassess. Hyatt chose to grab life by the horns. He recently moved to Liverpool to assume a new role as Professor of Contemporary Art and Director of ART Labs at Liverpool School of Art and Design, a decision he celebrates. As the interview draws to close, I ask Hyatt if he hopes for an afterlife for Rock Art. His reply is a fitting commentary on the exhibition, his life and his future. Rock Art opens on Fri 3 Feb and runs until Wed 29 Mar. Find out more here.